In Anthony Mann's seminal noir T-Men, as in his later morally ambiguous Western cycle, there are the makings of the kind of tough-minded, hard-edged, beautifully shot morality studies that Mann continually returned to. Here, he is slightly hamstrung by his material, an über-patriotic story that attempts to mythologize the agents of the U.S. Treasury Department as they ferret out counterfeiters and alcohol bootleggers. The script is an obvious piece of propaganda that aims to overcome the unglamorous nature of this work, propelling the "T-men" to the level of tough-guy feds who never rest until they get their man. The film opens with a mock-documentary sequence featuring a Treasury official reading a prepared statement about the functions of his department, then introducing the sample case that constitutes the film proper. This is naturally cheesy material, made worse by the overbearing voiceover that mars much of the film's first hour, a tell-don't-show omniscient narrator who delivers the party line about the bravery of the T-men and the greatness of Uncle Sam. Any other director, saddled with such a self-evidently mediocre script, would simply churn out the kind of moralistic low-budget gangster pieces that thrived on the lower half of double-bills in the 40s. Instead, Mann and ace cinematographer John Alton crafted an often-stunning piece of art from this crude foundation, cramming the film with gorgeous visual effects and even subtly working against the film's propagandistic agenda. The film follows Treasury agents O'Brien (Dennis O'Keefe) and Genaro (Alfred Ryder) as they attempt to infiltrate an elusive mob running a large-scale counterfeiting operation out of Detroit and Los Angeles. The two agents go undercover as criminals, slowly working their way up the chain of command in order to locate and apprehend the top levels of the criminal organization. Along the way, Mann and Alton engineer endless opportunities for visual experimentation. 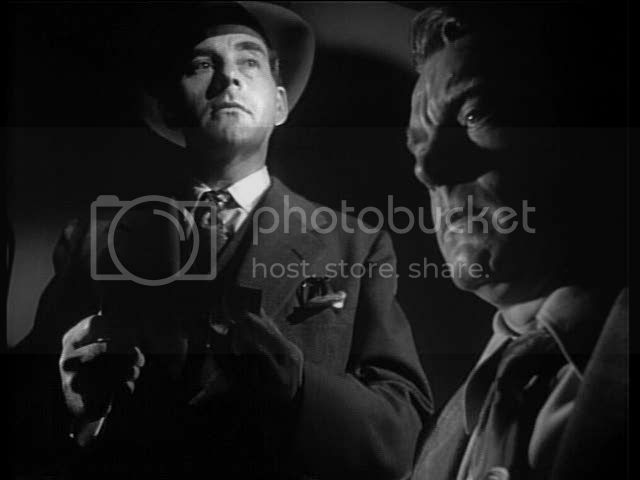 A stakeout scene, with O'Brien tailing the counterfeit ring's middleman, nicknamed "the Schemer" (Wallace Ford), becomes an exercise in creative cinematography: long shots of shadowy streets with the agent sulking in pursuit, then a wonderful sequence in a club where O'Brien hides in a phone booth, and the interior of the club is seen reflected in the glass in front of him. In other places, unusual camera angles create emphasis or highlight points of interest. In one scene, O'Brien has hidden a counterfeiting plate under a sink and is trying to retrieve it while both he and another hood are washing their hands in the cramped bathroom. Mann positions the camera below the duo, looking up at the plate taped to the sink's underside, with the two men towering above. It's a perfect vantage point that allows an unobstructed view of O'Brien's surreptitious attempts to grab the plate without arousing his companion's suspicion. The tension in the scene is subtly ratcheted up by the perspective, which emphasizes what's going on in a way that a more conventional view would not. In ways like this, Mann and Alton's visuals bring a great deal to a script that would otherwise have been entirely forgettable. In addition to the handicap of the pro-government propaganda, the script lacks the typical noir flair: its dialogue is nearly as flat and unexceptional as the droning narration, and the characters have little of interest as individuals. There are not only one but two femme fatales (including Mary Meade as a mob moll), but virtually nothing is done with either, and they wind up being just forgettable bit parts. Even the two leads don't have much opportunity to do more than spit out generic tough-guy lines. However, Mann is able to infuse several scenes with emotional frisson despite the blandness of the script, suggesting without words the intensity that is required of the biggest scenes. The film's unspoken emotional center is clearly the scene where Genaro, while undercover and walking with the Schemer, accidentally runs into his wife Mary (June Lockhart) and her friend. The friend recognizes him and calls him by his real name, while he steadfastly denies that he knows them. He finally comes face to face with his wife, who realizes that he can't blow his cover, and with a straight face she says that her husband is much taller and more handsome, then drags her friend away. It's a riveting scene, and Mann locates all the tension in tight closeups on Genaro's face, his forehead knotted and drawn taut around his slitted eyes. Everything in the scene is there in his face: his fear of being outed joined with the agony of having to deny his own wife, having her right there in front of him and being unable to kiss her, embrace her, even acknowledge that he knows her. The script itself never does anything to establish the importance of Genaro's marriage, to suggest the depth of his love for his wife or his concerns for her safety, and she appears and disappears for one scene only, never to be seen again. This one scene nevertheless perfectly captures the feelings churning beneath the surface; it's all there in Mann's closeups, in the tension around Genaro's eyes or the few tears dotting his wife's cheeks after he leaves. This economy of expression, necessitated by a minimalist, even bland story, is carried over into a later scene where O'Brien has to witness a murder committed by the counterfeiting gang and can't react without blowing his cover. 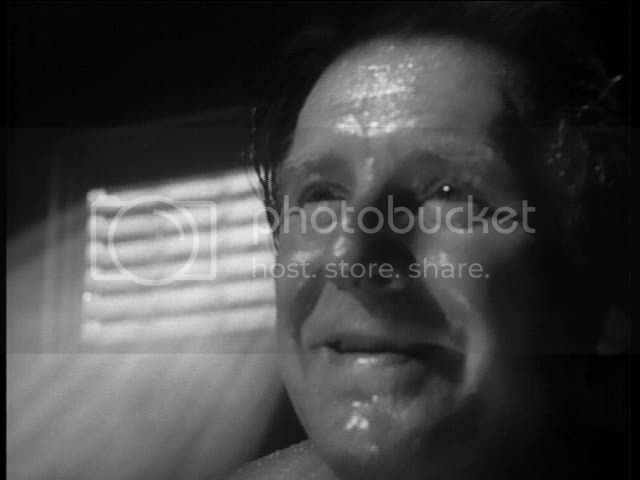 Just as in the scene with Genaro, Mann keeps the tension localized in the area around the eyes, his closeups capturing the deep shadow-filled lines etched into the agent's face by what he sees. In a film where the dialogue is as emotionally inert as a cardiogram flatline, Mann and Alton extract the maximum of affect from their actors' faces, inscribing the narrative's emotional undercurrents in a coded language of shadows, pointed looks, and worry lines. The effect is often startling, as a powderkeg of emotion seems to be ready to blow right beneath the film's cool surface. It's even possible to read in O'Brien's face at this moment the stirrings of a subversive question: is this worth it? Is stopping the flow of fake money worth letting a murder happen right before my eyes? He seems on the verge of acting, blowing his cover, doing something, his conscience straining against the strictures of his orders. By the film's cruel logic, these agents should be willing to pay virtually any price  even their own lives  for the sake of halting the economic and social crimes they investigate. Mann's film never explicitly questions this assumption, instead simply documenting, with his characteristic moral and visual rigor, the progression of violence and brutality necessary to put an end to this ring. The question under the surface, "is this worth it?" is never verbalized but lingers potently in the background, unasked by the screenplay, floating like smoke through the shadows with which Mann and Alton flood the frame.